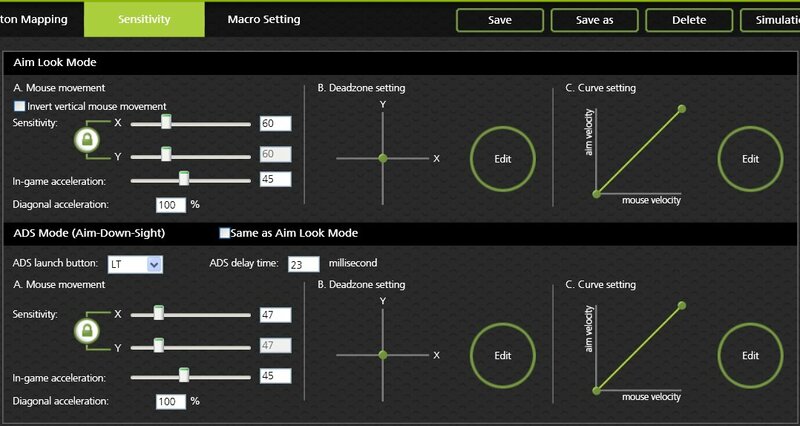 KeyMander Macro Mode: This profile uses Left Shift and Q for the same LC function (Left Shift for Sprint and Q for Lean Left when aiming-down-sights), so Macro Mode (F11) must be enabled or the Sprint function will not operate. Note: you may have to increase the Right and Left Stick Dead Zone if your controller sticks are worn. If the screen view moves while you are not touching the controller, you will need to increase the setting. I'm not sure what you mean by "jumpiness," but movement is pretty smooth when I tried it. Can you better what you experienced so we can better help you? Ok, I know what you mean. Your mouse settings need some adjustment to get you back into a better balance of speed versus accuracy. Every player will have a different balance point depending on how they play (run and gun vs. sniping), and there are trade-offs to each style of play. This is a rather lengthy explanation, but it will help you solve the problem. Before you make any changes though, make sure to set your mouse's dpi setting to the max (if your mouse is adjustable) and then set the dpi in the KeyMander software to match your mouse's max dpi. Try the new profile above with Mottflyer's settings and see how that works for you. this profile is trash, the only reason I even bought this product is because I wanted to be the best at rainbow six siege and after 2 weeks of using the product I've just gotten worse, I bought the keymander for 100$ and I hate it, worst decision of my life. Hi, just a quick question, what are the leaning keys for this profile? LC and RC are the normal lean buttons, so in our standard profile it would be L Shift and E for left and right lean. I don't remember how Mottflyer did his, but we are working on the ability to double bind keys so you could use Q and E for lean, then add L Shift for sprint also. Ok thanks, then if L Shift is for left lean, what is the sprint key? L Shift is also the sprint key, since in R6S LC is both sprint and lean left. Lean left will only activate when you are in ADS mode. My sensitivity is like 2 for ads and i don't what t do. I'm not sure I understand your question. Can you please explain what it is you are experiencing so we can better help? Okay so, when i first got keymander the setting for sensitivty where fine then my controller started vibrating and my keyboard and mouse disconnected now my sensitivity is messed up. Are you using the KeyMander PC software to adjust your profile? If so, did you lose the profile or reset to default settings? Is there anyway your able to setup on rainbow to have sprint as shift then while aiming in you need to click down the left stick to lean left but it dosnt Work because you sprint is click down left stick and then while aiming you need to click left stick to lean is there anyway you can change that? Using keymander ? You should still be able to lean with shift. Through the game when you aim down sights (pressing L2) it changes the L3 from sprint to lean, so the same thing will happen when you press the Right button on the mouse, it will aim down sights and if you keep holding the right click and press shift it should lean. So if you aim down sights and press shift at the same time it will not lean? I tried downloading Mottflyer's profile above for siege on Xbox One. However, it tells me that I don't have the correct program to open this file. Any suggestions for acquiring the right program to download the profiles? You need to import the profile through the software. You cannot double click on the file. Once you have the software open, right click on an open profile you want to replace then select import. Can i lean in keyboard and mouse in rainbow on console???? ?